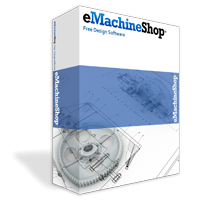 The free eMachineShop CAD software includes a bracket wizard. Just Download, fill in the dimensions and select a material. A bracket is an L-shaped device to connect two items at 90 degrees, such as a shelf to a wall. Enter the length, width and other parameters. Add any needed additional holes.